The chart shown above was shared by Richard Turnill and the BlackRock Investment Institute in BlackRock’s global weekly commentary. The chart displays year-to-date equity returns for a selection of major country/regions through the end of July. The orange circle represents the total return for each country/region. Total return is then broken out between dividends (blue shading), multiple expansion (purple shading), which is calculated as price change minus earnings growth, and earnings growth (green shading). 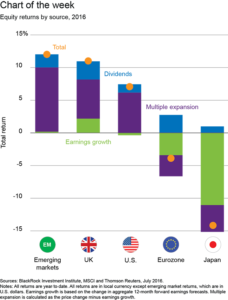 BlackRock’s view is that earnings growth, which has been flat to negative so far in 2016, would need to improve in order to generate further equity market gains. They are cautious for the second half because they believe an improvement in revenues and earnings may already be reflected in market prices. BlackRock’s main takeaway is that investors need to be more selective with their investments at these levels. BlackRock’s global weekly commentary is one of many market commentaries that we review on a regular basis. We like this chart because we believe it conveys a significant amount of information about the environment for equities in one picture. We believe the combination of positive equity market returns and anemic, or even negative, corporate earnings growth sets the stage for a potentially challenging period for equities over the remainder of 2016. We share BlackRock’s view that any further equity market gains without a subsequent improvement in underlying earnings growth will lead to heightened volatility. Historically, during periods of heightened volatility, investors have gravitated to companies that have displayed earnings stability and companies that pay dividends. Dividend growers are particularly favored. For a number of reasons, we are maintaining a relatively defensive approach in our portfolio construction, and U.S. large-cap dividend payers are among our favorite ideas.